Labour productivity is well below its pre-crisis trend (more than 17% in 2016Q2). 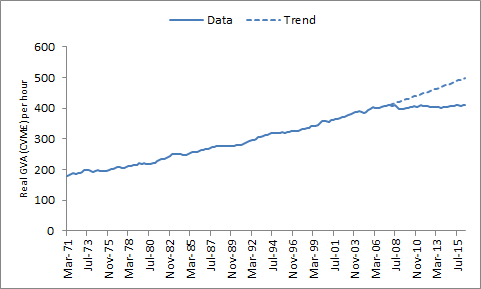 Chart 1 plots real, whole-economy value-added per hour worked and the continuation of its pre-crisis trend. It doesn’t matter when you start defining the trend or how you pick your axis, productivity is very clearly taking a walk in the wilderness and has been doing so for some time now. This matters a lot because people working to make, and do, things is our economy; and if the same people are making and doing less after the same amount of work, something has gone awry. It is no wonder that the topic garners so much attention from so many corners of academia and policy institutions. But labour productivity is not just lower than the trend line, it is also diverging from it: there is both a level and a growth puzzle. This is clearer if we zoom in a bit and add another trend line with the same growth rate, but take off from the bottom of the 2008 slump (Chart 2). The main hit to the level almost all happened during 2008: productivity took a huge hit during the crisis (not altogether surprising) but something stopped its return to trend afterward. This failure to return to trend is the level puzzle. The hit to the growth rate then takes off from the level puzzle but doesn’t start showing until 2010-11. 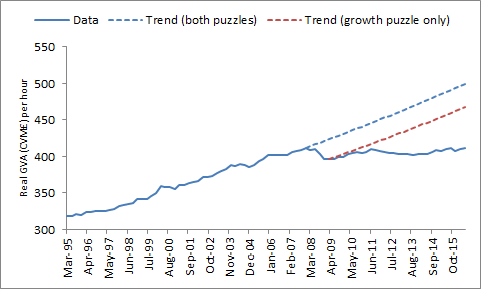 Since then, there has been no total growth in productivity, leading to a widening gap between the data and the trend line: there is a growth puzzle, even after accounting for the initial level puzzle. 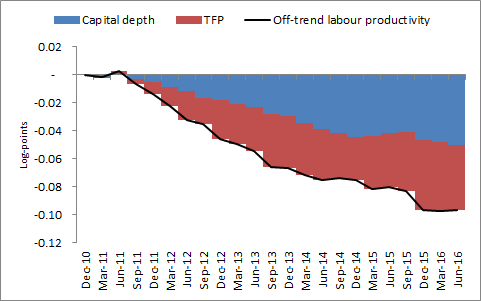 So there are two puzzles: why did productivity not return after the temporary (albeit huge) shock of the crisis and then why has productivity been growing so slowly more recently; each interesting in its own right and each potentially unrelated to the other. The word ‘potentially’ there is intentional – my goal in this blog is to establish how I think we should approach the puzzle(s! ), rather than to propose an explanation(s!) or to solve it them(!). If you want to explain why something changed over a stretch of time and you combine two distinct periods, you miss potentially crucial information. The driving forces in each period may cancel out, leading each to look less relevant to the whole. The tone in the third season of Arrested Development, for example, is masterfully wrought by jokes reflecting the writers’ resentment that the show had been cancelled; however if we talked about the show as a whole, we might miss this key element which was only specific to the third season. The puzzles I have outlined above suggest the path of productivity has been through two periods since 2007 and analysing them as such could help us to understand them. For example, one question that has aroused some controversy is how much of the puzzle is attributable to slower technology growth as opposed to slower growth in capital per unit of labour (slower capital deepening). 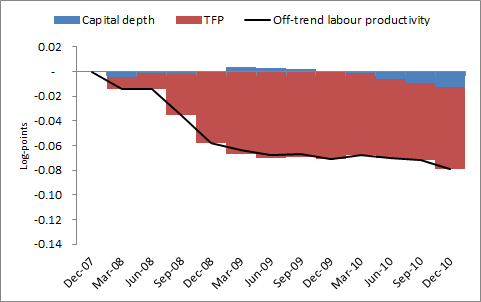 So, we can attribute changes in labour productivity to growth in either technology or capital depth, and we can also attribute deviations from trend to deviations from the trends in these two terms. Any decomposition of this sort is sensitive to the value of : here I use 2/3, which is a standard choice in the literature. Chart 3 shows that productivity grew by around 35% between 1990 and 2007, and that a little over half of this growth was driven by capital deepening and technology growth accounts for the rest (though beware – this attribution is sensitive to the value of ). So which of these terms is driving the puzzle(s!)?. This is a well-trodden path – Pessoa and Van Reenan (2014) use this kind of decomposition and find that around 80% of the gap between productivity and trend from 2008-12 is due to capital shallowing (p. 36). In contrast, Goodridge et al (2015) show that the attribution to capital deepening almost completely goes away when using a more appropriate capital measure (following Oulton (2013)) – the puzzle to 2011 is mainly a technology story. We have much more data now than when these papers were written, and it turns out that the attribution depends crucially on which of the puzzles you are trying to explain. 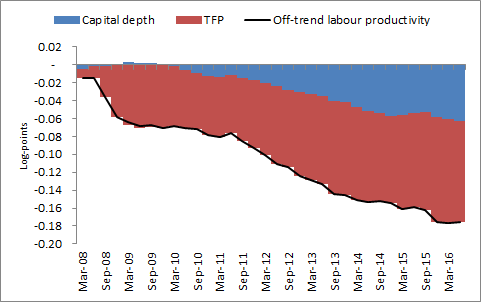 If we look at the post-crisis period as a whole (Chart 4), technology growth appears to be the main driver of the puzzle: although capital depth plays some role, it is not dominant. But if you look at the level and growth puzzles separately, a very different story emerges: the level puzzle is almost all technology (Chart 5), but the growth puzzle is due to both slower technology growth and less capital per person employed (Chart 6). Much work before now (including ours) has found that slower technology growth is the main driver of the productivity puzzle, but this reflects the lingering effect of the permanent hit after the crisis. Insofar as the hit is actually permanent, we should be more worried by the continuing slow growth, which adds to the puzzle every year and combines the effect of slow innovation and utilisation as well as potential labour and capital market drivers. This exercise comes with the standard caveats about the crudeness of growth accounting methods, but it shows very neatly how our analysis can be confounded by not recognising that there are actually two productivity puzzles. 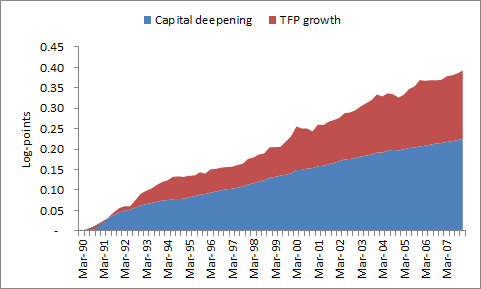 Correction (March 2017): the capital services data used in the above contains an error that understates the contribution of slower capital deepening to the second puzzle. The error and its impact are briefly discussed in an update here. Patrick Schneider works in the Bank’s Structural Economic Analysis Division. Previous Post Bitesize: Has the FOMC increased its focus on foreign risks?